A coolant leak, an overheating learning curve, and skipping Bryce and Capitol Reef National Parks. Last post I mentioned our plan to visit all five of Utah’s National Parks, and that circumstances had led to our seeing only three. Bryce fell by the wayside due to lack of easily available rental cars near Zion. The nearest available, aside from very expensive off roaders, were miles away with no affordable transportation options to get there. As for Capital Reef, we were on our way, within 50 miles of it, when The Big Kahuna overheated during a relatively high altitude and lengthy uphill climb, and appeared to blow a coolant hose. Gallons of antifreeze all over the side of the road, me not able to figure out where the leak occurred, and once again we were so remote as to not have cell service. Fortunately some DOT guys came by within minutes, drove me down the road to get service and recommended a mobile mechanic, who in turn passed me on to K & K Auto and Diesel Repair. Mechanic Andy arrived in about 40 minutes, topped me off with coolant, but could find no leak. A test run down the road lead to more coolant spillage within minutes, after which Andy was able to find an unused coolant hose connection coming off the main tank that appeared to have blown the deadheaded plug. He fashioned a new plug, but advised me to return to his shop in Salina to investigate the overheating further. Broken down on the side of the road without cell service again, but making the best of it. Grill on the right side, generator on the left, and mechanic in the back. 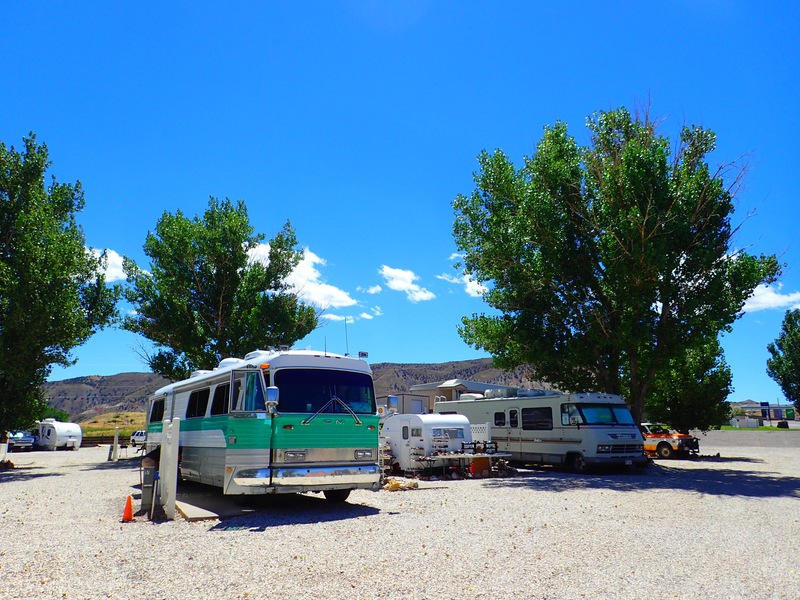 Turns out K & K also owns a co-located RV Campground, Salina Creek. It is pretty steeply priced at $25 a night considering that it is very basic; power water and sewage with no amenities in a low demand location, but they cut us major slack on the price since we were having work done there. The bottom line is that our water temp gauge is not functioning, giving us no heads up when overheating, and my reliance on the oil temp gauge is insufficient to prevent problems. Lacking immediate access to the specific Steward Warner gauge and sending unit, and since we did not want to wait for the couple of days it would take to get them, we went with the temporary solution of installing a mechanical gauge directly into the temp port on the coolant side of the engine. Perhaps of even greater importance, I changed my uphill driving method, basically cutting my speed in half during long uphill runs. The Big Kahuna’s overly tall gearing means that any significant uphill grade will drop us down into low gear, and I had been driving him at max low gear speed, about 28 MPH. In the summer heat and at altitude this meant significant risk of overheating. Now I run about 15 MPH on long six and seven percent grades, and I stop every couple of miles to check the temp gauge mounted in the engine compartment. This has worked quite well for us; last week we crossed the 11,000 foot Eisenhower and Vail passes in Colorado with no problems. For those keeping track, this is or third roadside breakdown; one leading to a lengthy tow and two requiring a mobile mechanic. Fortunately this one was far cheaper to deal with than the other two. I was wondering what you two were thinking of your lifestyle these days? Do you think you’ll live in the Big Kahuna for a long time? 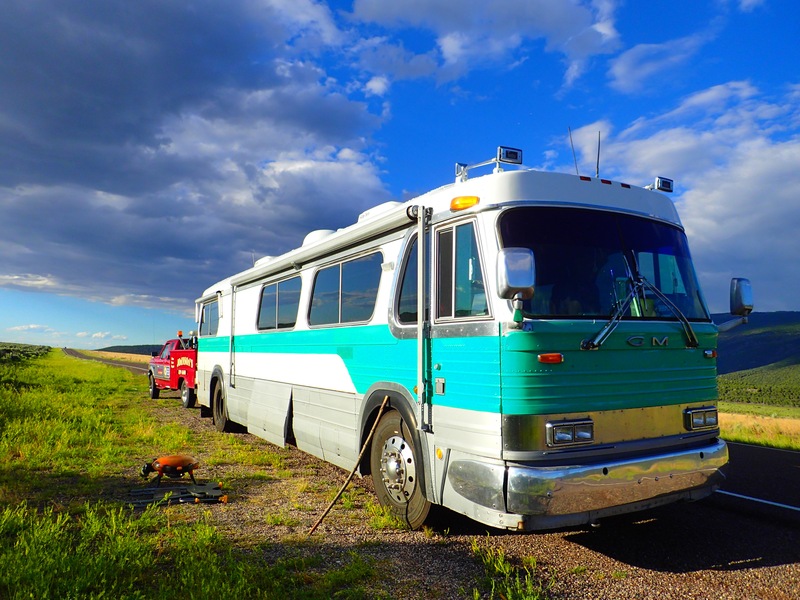 Are you loving the nomadic lifestyle?